Gary Johnson and William Weld. Bolstered by a unique political environment, the national Libertarian Party believes it could get on the ballot in all 50 states for the first time in two decades. But New England’s onerous ballot access rules stand in the way. National polls show both the Democratic and Republican nominees to be unpopular among voters — a situation that some political experts say is an opening for the Libertarians. While it’s extremely unlikely the Libertarians could win the presidential race, they could influence the final results — and make an unprecedented mark on political history. 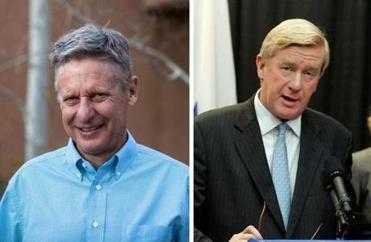 Currently Libertarian presidential nominee Gary Johnson, a former Republican governor of New Mexico, and his running mate, former Massachusetts governor Bill Weld, also a Republican, are on the ballot in 33 states. Of the remaining states where they are trying to get on the ballot, five are in New England. The only state in the region where they have made the ballot is Vermont. In Massachusetts, Libertarians need to collect 10,000 signatures by the end of July to get their ticket on the ballot. But some signatures will likely be deemed invalid, so party members are shooting for 16,000 names on their petitions instead. As part of the Libertarian Party’s efforts here, voters have been approached in public places, such as outside Stop & Shop grocery stores or along the Boston Pride parade route in the South End. Former New Mexico governor Gary Johnson and former Mass. governor William Weld spoke at the wide-ranging event. The party has hired a private company to aid its roughly 40 volunteers with the effort. Cris Crawford, 58, of Sherborn, who leads the Libertarian Party’s efforts in the Bay State, calculates that about 7,000 signatures have already been collected. Petition drives are occurring all over the country, according to the political director for the national Libertarian Party, Carla Howell, also a former candidate for governor in Massachusetts. If Libertarians do get on the ballot in all 50 states, it will be the first time that has happened since 1996. In 2012, they were on the ballot in every state except Oklahoma and Michigan, where a court ruled Johnson, who was the also the Libertarian nominee that year, ineligible because he had sought the Republican nomination earlier that year. Typically presidential candidates campaign in approximately a dozen swing states to win the White House. But the Johnson campaign strategy is different. Even though the Libertarian Party is trying to get on the ballot everywhere, the campaign says it will focus on a handful of states where it’s cheaper to campaign and voters have Libertarian inclinations, such as Utah, New Mexico, Montana, Alaska, and New Hampshire. The Johnson campaign goal is to deny Hillary Clinton and Donald Trump from getting to 270 electoral votes. This would kick the election to the US House of Representatives — and give the Libertarian Party some previously unattainable political credit. But Alan Abramowitz, who researches political party realignment at Emory University in Atlanta, is skeptical that the Libertarian ticket will be much of a factor. “Assuming they can get on the ballot everywhere, they could inch up to something like 2 or 3 percent of the vote,” said Abramowitz.